Fox Theatres gift cards are perfect for birthdays, holidays or any special occasion! Valid for admission and concession purchases at all Fox Theatres locations. 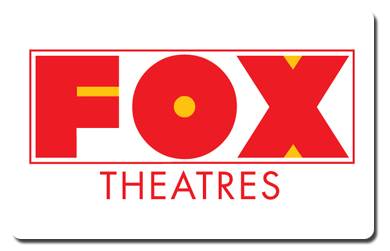 Card value can be added at participating Fox Theatres. Not redeemable for cash, except as otherwise required by law. No refunds, returns, or balance transfers. Fox Theatres is not responsible for lost or stolen gift cards.